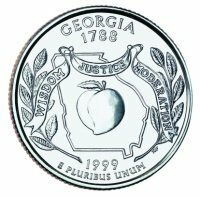 The Georgia State Quarter was the fourth quarter released under the 50 States Commemorative Coin Program Act and the fourth quarter issued in 1999. Live Oak sprigs on either side of the central design - a reminder of the official state tree, the Live Oak. 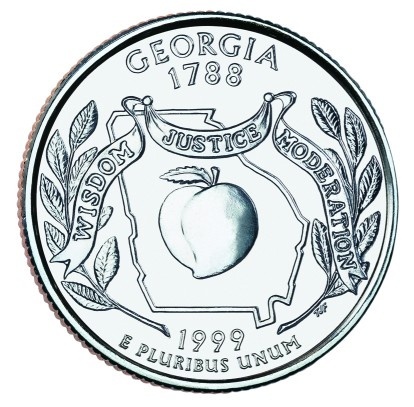 Georgia state motto - "Wisdom, Justice, Moderation"
The Georgia Council for the Arts was placed in charge of the design for the GA State Quarter. The Council created and submitted 5 designs to the United States Mint. Upon approval of four of these designs by the Secretary of the Treasury, the governor made the final selection that would be used on the GA State Quarter. Below is a table showing the design specifications and mintages of the Georgia State Quarter. Note: The modification moved some of the wording from the reverse to the obverse to leave the reverse available for the state's design. Reverse - Each state theme was proposed, and approved, by the governor of the state. Final design was created by T. James Ferrell. His initials appear near the bottom just to the right of E Pluribus Unum.